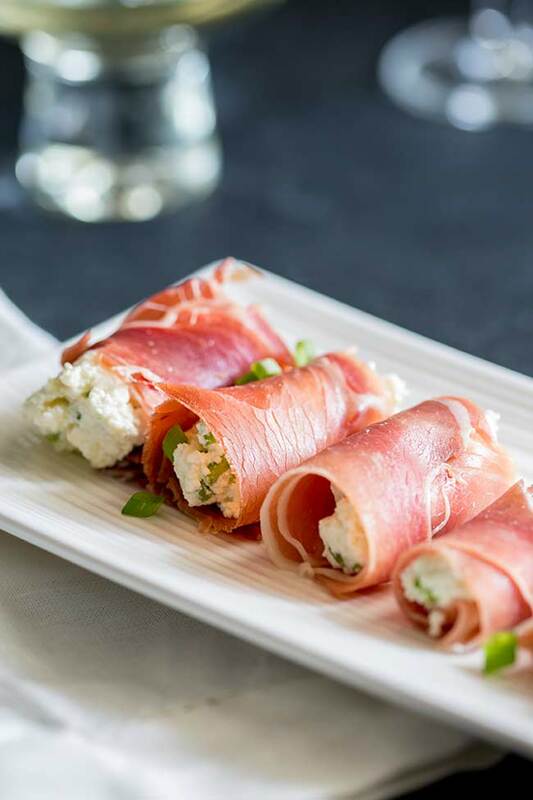 These Prosciutto and Ricotta Hors d’oeuvres are so quick to prepare plus they are so easy to eat, making them perfect for entertaining as no one wants an hors d’oeuvres that makes a mess! Plus they look elegant and taste amazing! 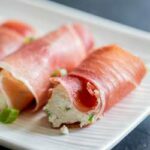 These Prosciutto and Ricotta rolls are so simple to make and can be made in advance. Start by finely chopping the green onion (or you could use chives), this gets mixed with the ricotta, some black pepper and onion powder. Once everything is well combined and smooth you want to cut the prosciutto in half length ways, to make two long strips. Place two teaspoons of the mixture on the short end of the prosciutto and then roll up tightly. The rolls want to chill for 15 minutes to make them easier to pick up. But they will keep covered in the refrigerator for 6 hours. Hors d’oeuvres are such a great way to cater a party. Plates of delicious morsels that can be passed around or arranged on a buffet table. How many Hors d’oeuvres to serve at a party? This very much depends on whether the Hors d’oeuvres will be a taster before dinner, or are they going to be the main event. I like to mix it up, sometimes I will serve just platters of Hors d’oeuvres and maybe a larger item like a tart or sliders, other times the Hors d’oeuvres will just start the meal and dinner will follow. To make sure I always have enough food…because anyone who knows me knows I never want people to leave hungry I have a few rules I follow. 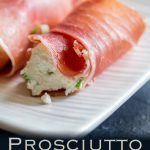 These Prosciutto and Ricotta Hors d’oeuvres are so quick to prepare and they are so easy to eat, making them perfect for entertaining as no one wants an hors d’oeuvre that makes a mess! Plus they look elegant and taste amazing! Mix the ricotta, chopped green onion, black pepper and onion powder together in a small bowl. Cut the prosciutto in half crossways. Place about 2 teaspoons of mixture at the short end of your prosciutto and then roll up like a cigar. the exact amount of filling needed will depend on the size of your prosciutto. Cover and refrigerate for at least 15 minutes, or until needed. Everyone is having a wonderful time, you float around the room, chatting, laughing, drinking a spiced capsicum martini and generally having a great time. It is exactly what you wanted for your birthday. A small party, some amazing food, a few cocktails, and your dearest friends. Everyone has a full glass; the perfect time to bring out some hors d’oeuvres. You prepared everything earlier so you know that it is just a case of pulling the platters from the fridge. 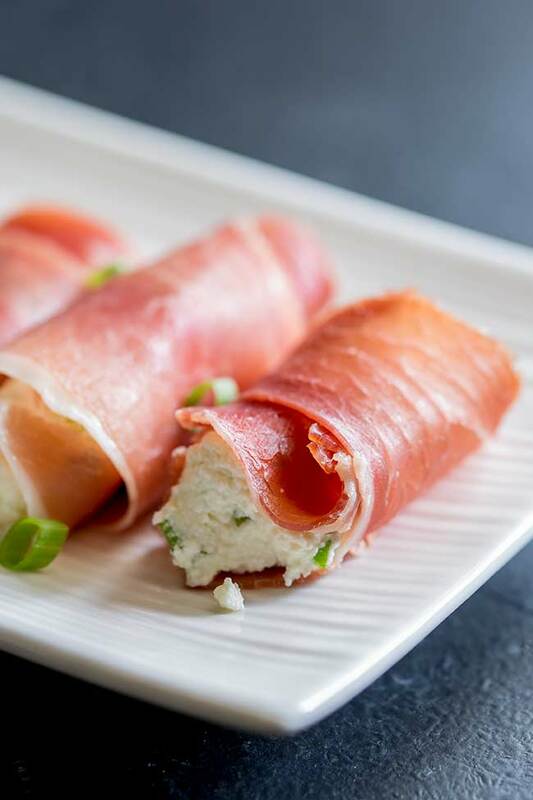 The prosciutto and ricotta rolls come out first, deep pink prosciutto, salty and soft, wrapped around creamy fresh ricotta spiked with green onion. A delicious little bite, soft with a delicate chew, rich and creamy and oh so delicious. Arranged on a white platter they look elegant, you know they won’t last long, but that is okay, your foodie friends know that hidden in your fridge there are more platters of delicious morsels. There are oysters, bell pepper crostini, dill pickle beef skewers, cured salmon, sesame tuna and some mini chocolate tartlets. Plenty of little bites. But for now it is time for these deeply pink and so beautiful prosciutto and ricotta hor d’oeuvres. A cocktail party with your friends, the best birthday. And as for your age? Well that is just a number! 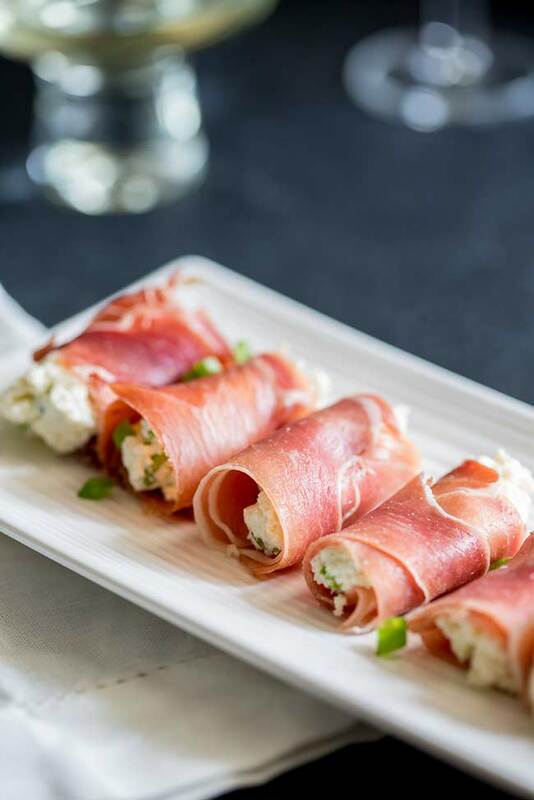 If you love food why not subscribe to my newsletter, I will drop you an email every now and then, just to say hi and send you a couple of recipes think you might love, like these Prosciutto and Ricotta Hors d’oeuvres. This could possibly be the best thing ever. Seriously. So decadent and delicious, this is totally my kind of snack. Def making this! Thank you Danielle, they really are so yummy and quick to prepare. Wow, what an awesome, low carb appetizer!! Anything with prosciutto is a winner by me. Love this recipe! P.S. Hope you made it home safely!!! Sounds like the perfect birthday party! Happy Birthday! And what a wonderful appetizer to start the evening. Prosciutto is one of my favorites to serve, usually with melon, so this gives me another option for my next get-together. Love the way you also give ideas for quantities with and without dinner.